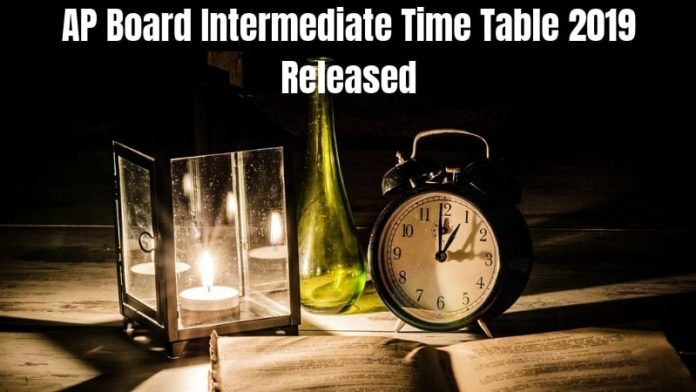 Andhra Pradesh Board of Intermediate Education, Vijayawada has released the time table for the Intermediate standard candidates. AP Board Intermediate Time Table 2019 is available online on the official website bieap.gov.in. The time table is available for Inter first year and second year both. For class 11, the board will conduct the exams from February 27 while for Class 12, the board exams will be conducted from February 28, 2019. Go to the official website. Candidates can get the link on the homepage of the board’s website. Click on the link and the time table will appear to you. It is present in the pdf format. Candidates must download the time table and then take the printout of it for the future reference. The time table contains the date for the exams, the days for the exams, exam timings, the subject code, and the respective names. According to AP Inter First Year Time Table 2019, the exams will begin from February 27, 2019. The first exam will be held for 2nd Language Paper-I. After 17 days, the exams will be finished. So, the last date of the exams is March 16, 2019. The last exam for Class 11 students is Modern Language Paper-I. For Inter second year students, the 12th time table is also available. AP Board will conduct the exams for class 12 from February 28, 2019, and will be finished on March 18, 2019. The students will give the exams for 19 for days. The first and the last exam will be held for 2nd Language Paper-II and Modern Language Paper-II respectively. The timings for the board exams for Inter first year and second year is the same. The board exams will be held from 9:00 am to 12:00 pm. For Ethics and Human Values Examination, the board exams will be held on January 28, 2019. It will be conducted on Monday from 10:00 am to 1:00 pm. The board exams for Environmental Education will be held on March 30, 2019, i.e. on Wednesday. The AP Board will conduct the practical exams from February 01 to February 20, 2019, i.e. Friday to Wednesday including Sundays. It will be conducted for the General Intermediate courses in Jumble system. These practical dates are applicable to Intermediate Vocational Courses also. However, the time table for the vocational courses will be released separately very soon. The board which manages the exams for the Intermediate standard is Andhra Pradesh Board of Intermediate Education. It is well known as BIEAP. The board came into existence in the year 1971. It conducts the board exams in the month of March for both first year and second-year students. Over 10 lakh student appear for the examination every year. Those candidates who do not get the passing marks in the board exams and apply for the supplementary exams, the board also conducts the exams.